Created 174 Ikebana works in drama! This summer was the most exciting one in my life. I supervised and also created Ikebana as an Ikebana artist in a Japanese serial drama that included 10 episodes. 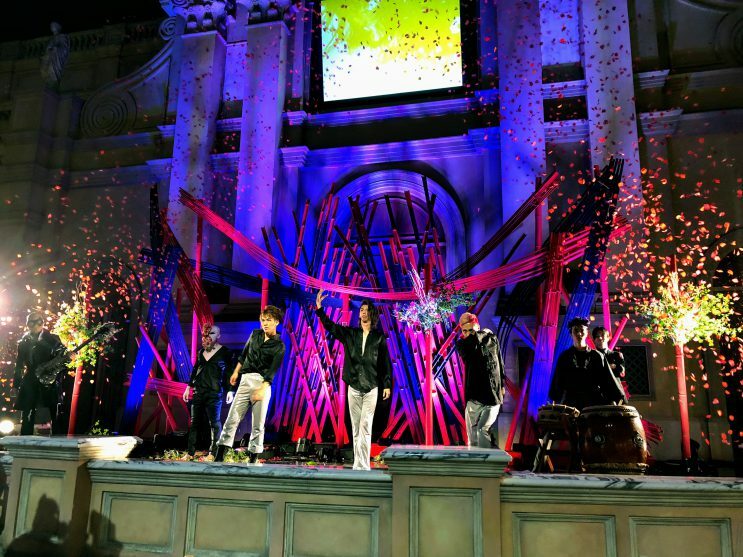 The drama shows Ikebana world and people who live in that world. Many characters who are Ikebana artist appear in drama. When I heard this mesmerizing story form TV producer and screen playwright, I though this was a precious opportunity for me to show Ikebana to as many people as possible. 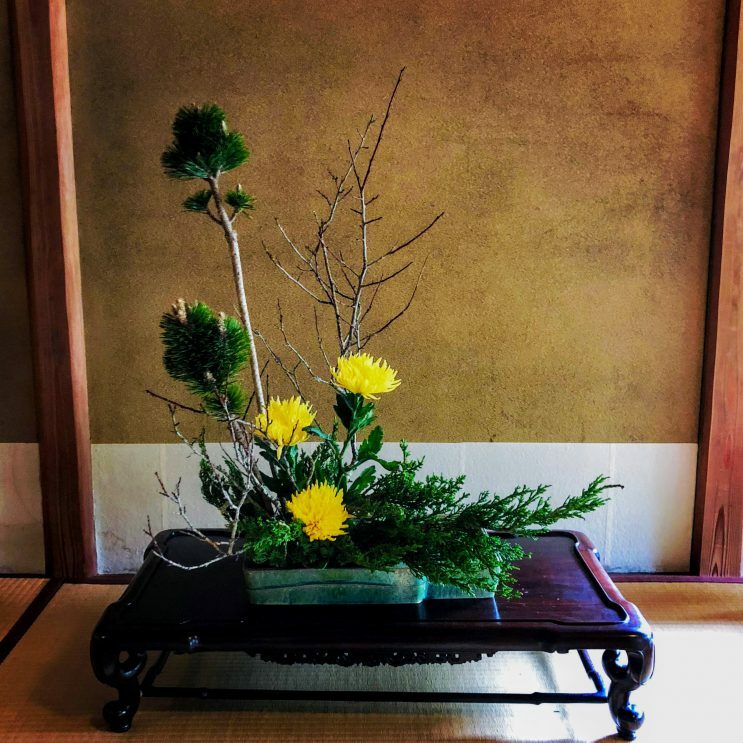 Most of Japanese know the word of Ikebana, but they don’t know how Ikebana is truly like at all. Ikebana is an art, like paintings, music, and sculpture like Sofu Teshigahara ( 1st president of Sogetsu school) said. Drama’s name is “Born to be a flower” (高嶺の花）The main character is a beautiful woman who is a daughter of the president of a fictive school. People think she will inherit the position of president from her father. She has to get married with some eligible high-class guy, but she falls in love with a guy who is not rich, not handsome, but just gentle and pure. Drama shows 2 different world, the gorgeous Ikebana world that she belongs to and the working class but friendly world he belongs to. As for Ikebana world, many characters make each own Ikebana. Some guy is fighting with another guy silently and they fight with flowers. I reflected each character on each Ikebana. The challenging point is how make each Ikebana look different and make them be meaningful in the story of drama. She is Satomi Ishihara, beautiful actress and acts heroin. 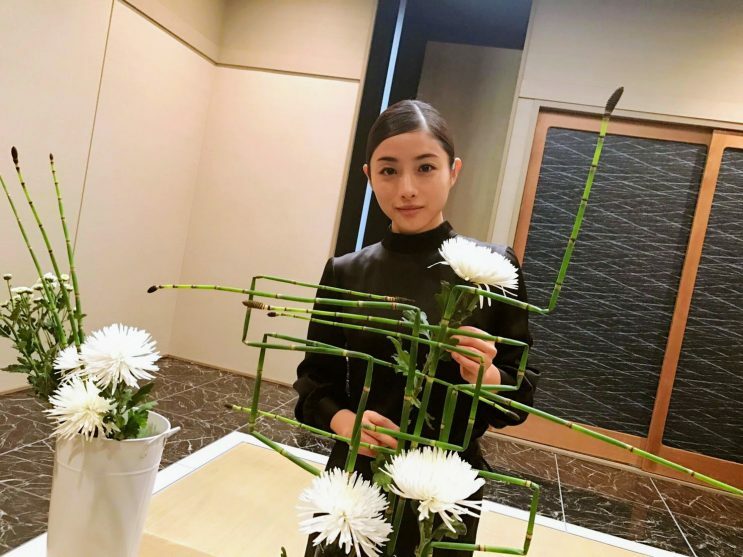 Her Ikebana should be stylish and something new. 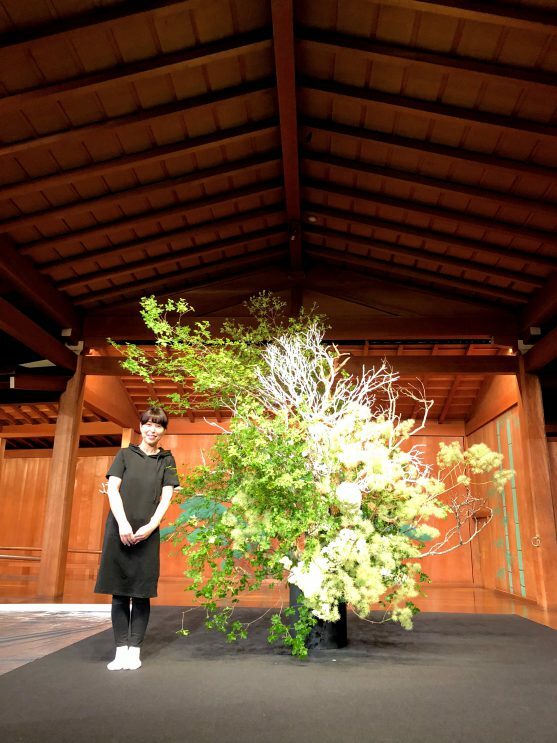 Her farther’s Ikebana is heavy, deep and traditional as he is a president of a school. This is heroin’s Ikebana in her demonstration. She gets depressed with a lot of pressure and burden and she never use vivid and clear colors a lot in her Ikebana. That’s director’s request. Every Ikebana I made in drama has a meaning and can be a powerful effect to make story get deep.I used mainly green color avoiding pink and yellow happy colors in this huge Ikebana. 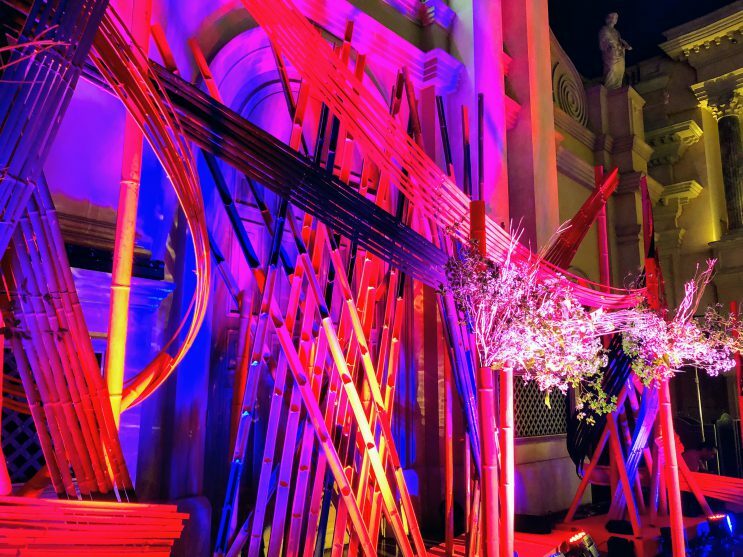 The largest Ikebana, maybe I can say a big installation, is this. The height of venue is 16m. 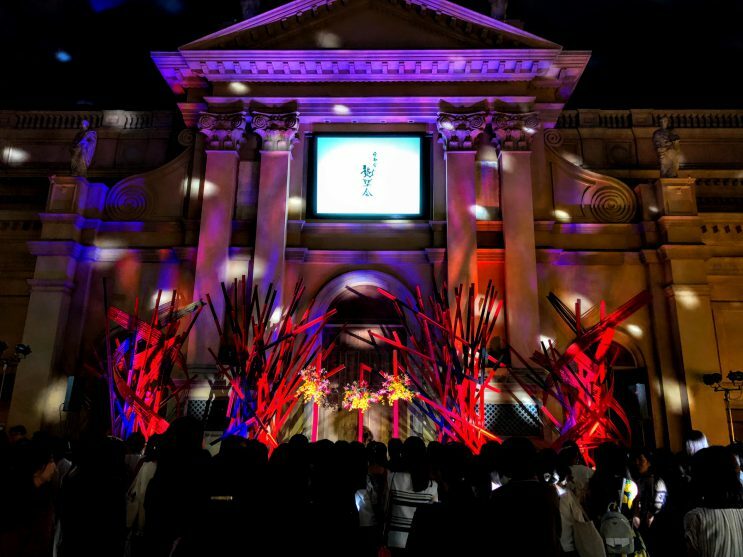 To make a powerful entertainment in this huge venue, I used more than 50 bamboos that have 4m height. One guy has a great ambition and thinks Ikebana can be a good business. 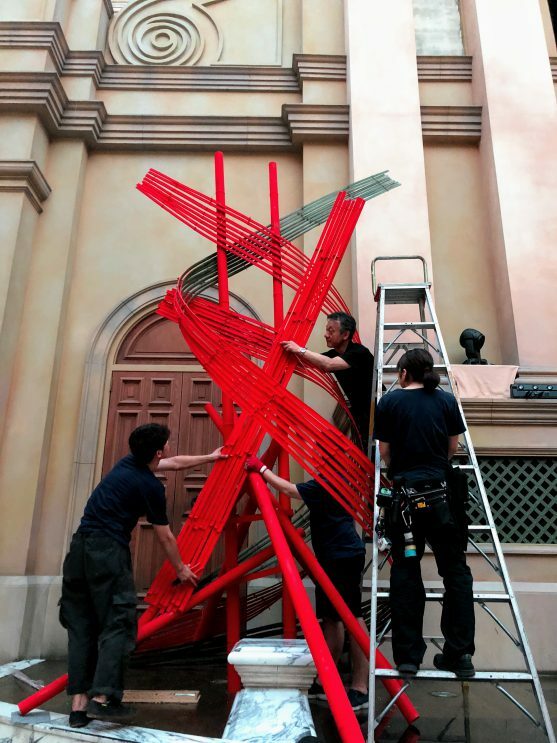 His works should reflect his ambition and I used red and black as a sign of ambition. I painted Bamboo with red and black and cut in 2 parts, then showed inside part of bamboo. From a distance they look small, but each one is huge. This part is made from a band of split bamboo. I love split bamboo as they are flexible and can express easily a beautiful curved line. Now I’m checking the center part of the stage. I cut a part of bamboo and made that a vase and arranged flowers. It’s show time! 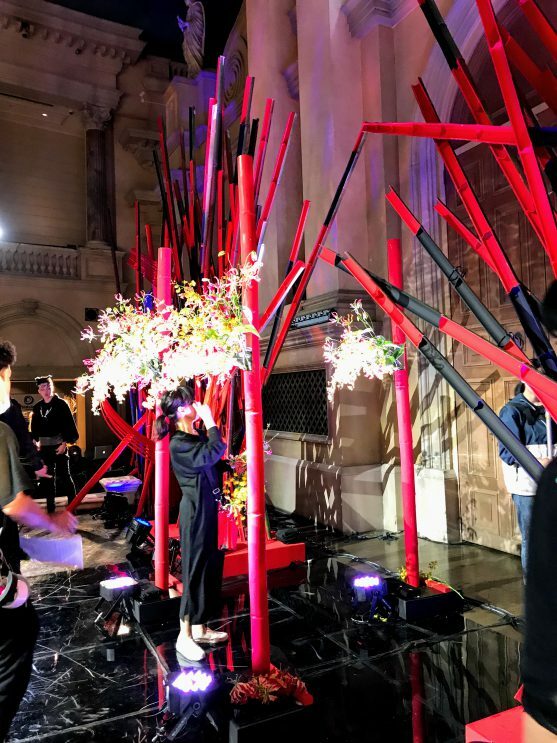 the collaboration work, music and dance and Ikebana.